Family Fabaceae Lindl., genus Phaseolus L.
Annual plant (biennial and perennial forms occur). It is a very polymorphous species. Differ by bush type: bush, semi-bush with twisted top, semi-twisted and twisted. Grassy stem becomes slightly wooden near base, branchy and pubescent. Stem color green, pink or violet. Stem length for bush forms reaches 25-50 cm; forms with twisted top reach 50-75 cm; semi-twisted forms reach 1.5 m; twisted forms reach 2-5 m. The first leaves are obovate or heart-shaped, opposite; then trifoliate, compound, alternating leaves (4-12 cm long) develop. Leaflets are of different forms; yellowish green, green, dark green, anthocyanic; downy. Pedicels are 4-20 cm from leaf axil or on the top; flowers grow in 2-8 pairs. Flowers are bisexual, pea-like (14-27 mm), white, green-white, light pink, pink, dark pink and violet. This species reproduces by self-pollination only. Fruit grows in bean pods of differing form and size (7-28 cm), with 5-8 seeds on average. Bean categories are distinguished according to market quality characteristics: husked (dry beans), with coarse, thick parchment layer and fiber; and sugar (fresh market), without parchment layer and fiber. The color of immature beans ranges from yellow, different tones of green, to violet and motley. The color of mature beans ranges from yellow, greenish, to brown or cream-colored. This species is affected by bacterial and viral diseases and anthracnose. Subspecies classification (O. Comes, 1909) is based on shape and color of seeds. Four distinct varieties are distinguished according to shape: var. compressus (DC) Comes, var. oblongus (Savi) Comes, var. ellipticus (Mart.) Comes, and var. sphaericus (Mart.) Comes. This species is a widespread crop, growing in the tropics, subtropics, and countries of temperate climate between 60-70 degrees of latitude north and 85 degrees of latitude south. Dry bean is cultivated in the USSR on 35 000 hectares: Ukraine, Moldova, Byelorussia, Transcaucasia, Northern Caucasus, Central chernozem (prairie) zone, the south of the Non-chernozem zone, Central Asia, Kazakhstan, Western Siberia, and the Far East. 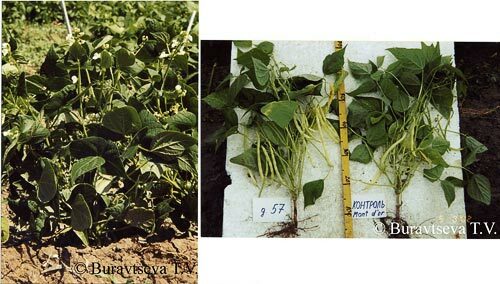 String beans are more suited than dry beans for cultivation in northern areas. This species requires adequate moisture and heat. It is a mesophyte with respect to moisture but is drought-tolerant during the vegetative phase. The optimum soil moisture is 65-70% of field capacity. This plant prefers heat. Annual precipitation should be 450-500 mm. Prefers chernozem soil, loamy, limy or red earth (Georgia). Optimum soil acidity is between pH 6-6.7. Typically a short-day species, there are also day-length-neutral varieties. Regulates light exposure of leaves by means of phototropism, to avoid heat over-exposure in the south, and to maximize photosynthesis in northern latitudes. This species originated in Mexico and Central America. Wild direct ancestors are not known. Presumably the ancestor is Phaseolus aborigenus Burk. The string bean was delivered to Europe, apparently, during the second journey of Christopher Columbus. It arrived in Russia in the second half of the 17th century, and, at first, was used as a decorative plant. In the second half of the 19th century, it was valued as a vegetable and grain crop. The first locally adapted sorts in the USSR appeared in 1938. By 1993, 65 varieties of grain and 32 varieties of vegetable string bean were in local use. Typical crop requires tilling between rows; used in crop rotation after sugar beet, potato etc. It is a good predecessor for corn, spring wheat and other cereals. It produces a bumper crop when manure, chemical fertilizers or mineral fertilizers are applied. In Nechernozemnyi zone, nitrogen fertilizer is added during treatment of the ground with a cultivator. String bean is a late-sown crop. It is important that the soil temperature at the depth of sowing (5-8 cm, depending on soil type) is 12-14°C. Spaces between rows must be 45-60 cm. Yield ranges from 80 to 150 kg per hectares, depending on seed size. Vegetative period lasts from 65 to 120 or more days. Dry beans produce 24.7 tons per hectare. Has high food value as a grain and vegetable culture. It is used also in medicine and for agro-technical purposes (improves physical properties of soil and enriches it with nitrogen). Ivanov N.R. 1961. String Bean. 2nd Edition. Leningrad-Moscow: Sel.hozgiz. 280 p.
Korenev G.V. 1990. Plant Growing with Basics of Selection and Seed Growing. Moscow: Agropromizdat. 574 p.
Kurlovicha B.S., Rep.eva S.I., eds. 1995. Genetic Fund and Selection of Dry Pod-bearing Plants (lupin, vetch, soya, string bean). Theoretical Basics of Selection. V. 3. St. Petersburg: VIR. Niklyaev V.S., ed. 1990. Basics of Agriculture and Plant Growing. Moscow: Agropromizdat. 478 p.
Stakanov F.S. 1986. String Bean. Kishinev: Shtiintsa. 193 p.
Zhukovoi N.M., Maksimenko V.P., eds. 1986. Cultivation of strong bean. Recommendations. Novosibirsk: VASHNIL, Sib.dpt. 14 p.